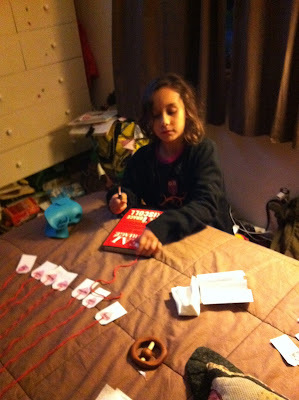 Thanks to Pinterest, Nat and I came up with the perfect valentines for her classmates this year. Handmade is always the best and I love to see that she wants to make something for her class. Last year we made paper valentine hearts she gave out but this year I wanted to step it up a notch. I found some ideas online and gathered them onto my We Heart It Pinterest Board. Finally I found two projects that I mashed together and had the idea to make Pencil Valentine Arrows. It did take awhile cutting out all the pieces and gluing them together but we were so proud of our valentines. They were a big hit with Natalie (which of course, makes me feel awesome) and with her friends as well. To be honest, I can't wait to make more arrows and they don't even have to be for Valentine's Day either! Such cute little Valentine's! I heart them.